Mercury and Saturn Close Conjunction, originally uploaded by CircadianReflections Photography. 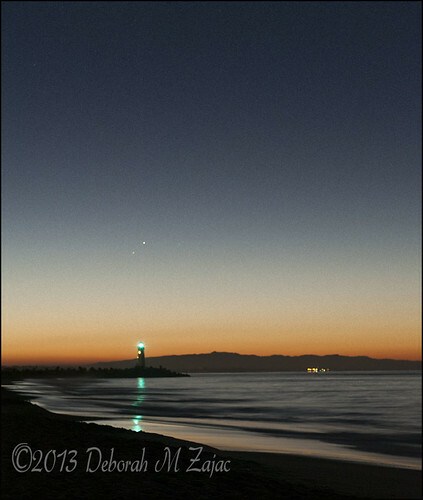 Mercury is the brightest Planet, and Saturn is the dimmer one under Mercury above Walton Lighthouse in Santa Cruz, CA. I don’t know what the faint star to the right is called. As expected I didn’t see ISON at all and it didn’t show up in my photos. It’s too close to the Sun now to be seen. The star to the right is Zubenelgenubi. It’s actually a double star in the constellation Libra.